Last Fall we debuted our Apple Cook-Off and we were not disappointed. From Gravensteins to Granny Smith, Red Delicious, Golden Delicious, Braeburn, Northern Spy and Pink Lady, we presented you with Apple Springrolls, Apple Butter, Apple Tartlets, Roast Pork with Apples, Apple and Chestnut Stuffing and a concoction of Apple Juice, Apple Cider and Kentucky Bourbon Whiskey. (Click here http://forums.egulle...cook-off-index/ for the complete eG Cook-Off Index). Apples are a worthy fruit no doubt, but today we enter into a more passionate and exotic realm of fruit cookery with the launch of eG Cook-Off #68: Citrus Fruits. Late January is the peak of the citrus season. At least it is up here in the Pacific Northwest, where nary a blood orange or key lime ever drops from a local tree. This time of year our markets are groaning with huge orbs of Texas grapefruit, pommelos from Mexico, oranges from Florida and exotic citrus flown in from far-flung Asian ports. Our neighbors to the South, the agri-wonderland of California, delivers mandarins, minneolas and blood oranges to Spokane within just a few days of being plucked from the tree. And I can’t get enough. I’ll never forget the huge grapefruits, larger than two fists, that Mother would serve us for breakfast. She indulged our sweet tooths by showering the cut halves of fruit with sugar. We never had to struggle with scooping out the meaty supremes. Like a fine surgeon, Mother cut the fruit precisely so we’d be able to maneuver every tangy, sweet segment using the serrated silver spoon handed down by my Grandmother. I imagine my Grandmother Edna May Pink serving freshly squeezed grapefruit juice in small, hand-cut crystal glasses as a “first-course” at her ladies' bridge club luncheons. Or maybe a simple dessert course of a broiled half grapefruit studded with a candied cherry and served in a wide crystal goblet, the little silver spoon to the side. Oh, the memories of grapefruit. One fondly dreams of the warm, boozy, classic French “Baba Au Rhum” surrounded by a center of “glace' oranges” and decorated with tiny, crisp, candied tangerine leaves to close the curtain on a grand feast at L'atelier de Joel Robuchon in Las Vegas. I long for a suckling baby pig, no more than 12 pounds, turning ever so slowly on the rotisserie spit over glowing embers of white oak, the sweet scent of a pineapple-tangerine glaze dripping onto the coals as the crackling, golden skin shines. For our Cook-Off, I’m thinking of starting with a lemon souffle recipe that was served during the reign of Edward VII. Citrus fruits were rare at the time and even the overly indulgent Edwardians considered them expensive, only to be served on important occasions. It's that time my friends. You have resolved to lose weight in the New Year. To eat better and to exercise. For a cook, that means challenging oneself to exercise creativity in the kitchen using a fruit that decidedly brings energy and good health. So off you go. Begin crafting your dish, create a shopping list and present us with "fruits" of your labors. Welcome to eG Cook-Off #68: Citrus Fruits. I am so glad you started this but David, oh David how could you? Broiled PINK grapefruit with maraschino cherries. Is that not an anachronism? However, I will avert my eyes and attempt to contribute to the Cook Off. I am assuming sweet and/ or savoury? What Mother served back in the 60's and it is still delicious. I start with a good dusting of powdered sugar and broil that. Then a layer of granulated sugar, broiled, and a second and third! The result is a crispy shield over that "pink" grapefruit. By the way, for sake of the photo prop there is a fourth maraschino cherry in the center of the fruit. Now that's livin. What would we do without citrus? If I don't have lemons around, that's when I know my pantry is truly empty. David, are you looking for how we use the whole fruit or is just the juice ok? Like many, I rely on citrus juice as an ingredient all the time, but rarely feature the fruit itself. I'll be interested in how others do that, besides eating it straight from the skin (as I sit here peeling a clementine). As for the part about losing weight, that depends. The delicious tart I made last week with meyer lemons--between the pate sucre and the creme fraiche and 5 eggs in the filling--had nothing to do with dieting. Nor does the Baba au Rhum you describe--it sounds amazing, one of my favorite desserts, but the calories in the boozy sugar syrup that douses the babas can't be small. I'm one of those people who would rather have lemon than chocolate in my desserts, so I don't begrudge those calories at all. Broiled grapefruit with BROWN sugar. Now that's good. If it's for dessert and not brunch, you can dose the grapefruit with a splash of rum before adding the brown sugar and broiling. 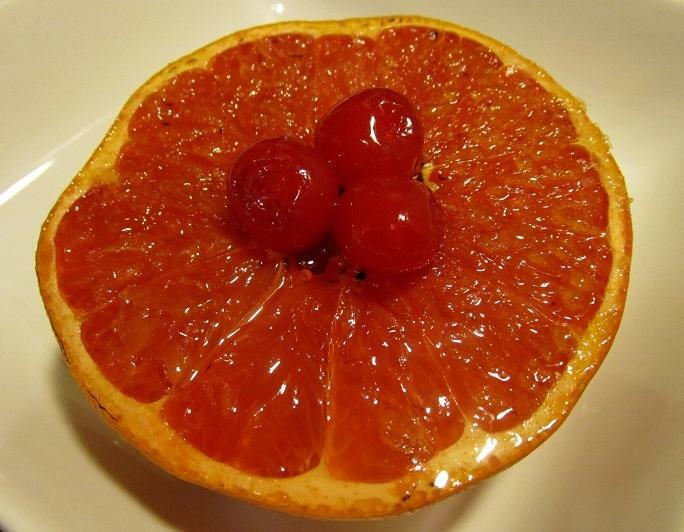 Our broiled grapefruit got a splash of grenadine syrup rather than sugar. Anything is on the table during a Cook-off so that means whole fruit, fruit segments or fruit juice. Whatever your recipe calls for. Part of the fun of the Cook-Off's is how we use the ingredient in different ways. I have a calamondin orange tree, a Meyer Lemon tree and a yuzu orange tree. They are all indoors in pots, and they all produce full size fruits. The flowers make the whole house smelling good. bugs ? any Bugs on those trees ? agree about the wonderful scent. I'm going to have to buy myself a lemon tree. I made a vow a couple years ago not to buy any citrus - it has to be from my trees or gifted to me. Being in the Los Angeles area that is not exactly a difficult path to follow, though at times a tangerine has to stand in for an orange lets say, or lemon for lime. My most recent revelation was lemon zest and juice in a simple pasta dish using browned onions, garlic, lots of course black pepper, and a generous amount of olive oil. Yesterday I had lunch with a friend who has several established and abundantly fruited calamansi trees. I'll post a picture of my mini haul tomorrow and how I use them. I like Meyer lemon thinly sliced and tossed with broccoli and shrimp - generous glug of olive oil - roasted at high heat. My favorite wake-up drink is grapefruit juice in club soda. About one juicy half in a cup of soda. Recently got some lovely pink ones from a friend in Palm Springs where they thrive - a true treat. Heidi that all sounds so delicious and refreshing. I was going to compare this cookoff to the one last fall but they're really just apples and oranges. I have this gorgeous Calamansi (Kalamansi, Calamondon, Kalamondon plus a dozen different names) and the wretched thing has yet to bloom. I have raised it from a seed and it even has thorns on it. It came from the trees of a friend and her trees are much producing. It's not fair!!!! Thanks dcarch. A very discouraging thing to watch this glorious bushy tree grow and grow and grow. Maybe I'll do just buy a grafted one if I can find one in Peterpatch. Love the marmalade the little fruits make. I've posted in the Camping, Princess Style topic about the riches of citrus available where I grew up, in the San Joaquin Valley. Part of what we came away with is a lovely variety of navel oranges: the standard Washington navel and the new Cara Cara variety. 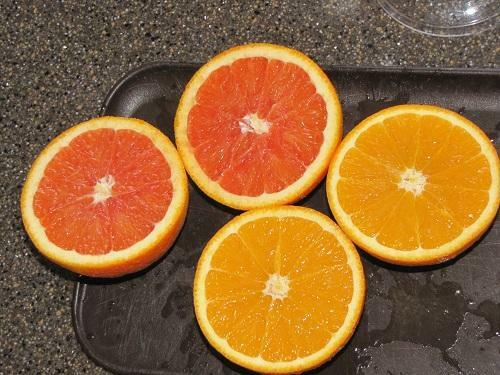 Do not confuse the Cara Cara with a blood orange! It is truly a navel orange, but with a slightly sweeter taste and lower acidity than a standard Washington navel. Last night I put the juices of these, as well as lemons, to good effect. 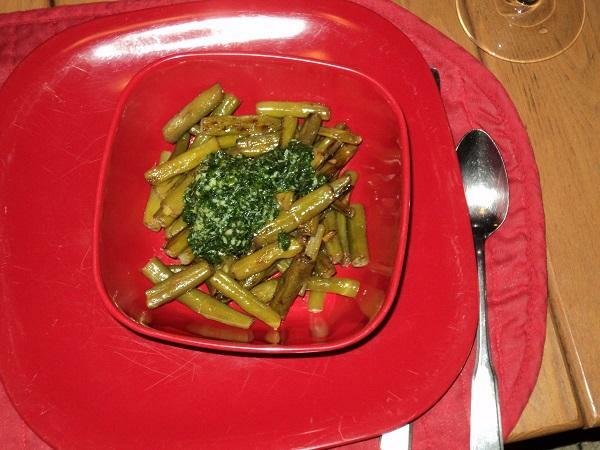 I started with fresh green beans - washed and trimmed - sauteed in olive oil with a touch of garlic. After they'd browned slightly I added a bit of water, covered and simmered until tender. (I thought I'd added a squeeze of orange juice, but if I did, my notes don't reflect it.) Meanwhile I'd made something akin to gremolata, or perhaps it would be more nearly a parsley pesto: 2 bunches parsley leaves, 3 or 4 garlic cloves, 1/3-1/2 cup olive oil and the juice of 1 Meyer lemon, whirred together to a fine paste then whizzed up with grated Parmesan. That sauce dressed the finished beans. 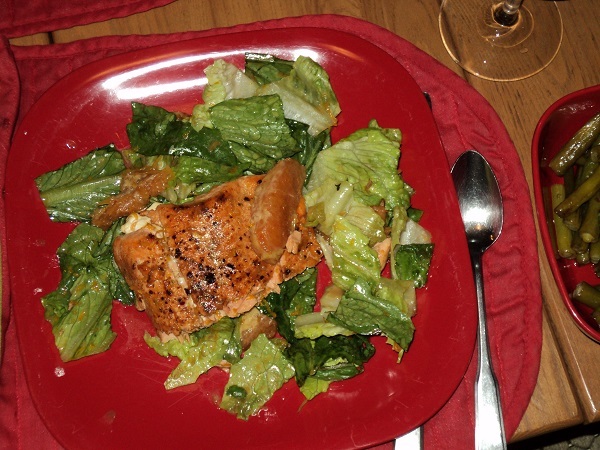 Salmon with orange vinaigrette over wilted greens was another experiment. I dusted a filet of silver salmon (with the skin on) with cumin, Aleppo pepper, and a bit of paprika, then browned it in butter. When the fish was browned on the flesh side it went onto a metal plate and into a low-temp oven to finish cooking. Into the skillet with the leftover oil and juice went chopped garlic; when it started to turn golden I deglazed with orange juice; when the garlic burned I threw the lot out and tried again . This time the steps were: a film of oil into the pan, without garlic; a brief saute of the sections of a Cara Cara orange; a deglazing with the juice of another orange and a touch of balsamic vinegar, and the lot cooked down. By this time the fish was, alas, slightly overcooked. Nothing to be done about it. The fish went onto a bed of chopped greens, the vinaigrette and orange segments went over the lot, and dinner was served. The flavors were good, but the dish needs tuning. The dressing didn't wilt the greens, possibly because there wasn't enough oil in the dressing and possibly because Romaine lettuce is too firm. The thicker parts of the fish were dried out because of kitchen disorganization. I kept notes, and will try it again. I invite others to join me! No pictures because it was a big surprise. 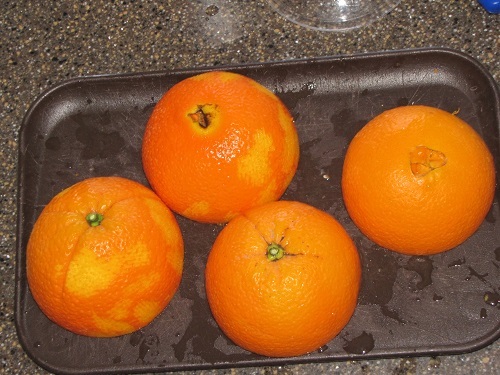 I had a few lousy tasting oranges in the refrigerator. Didn't want to throw them out, and couldn't eat them fresh. I decided to cook with them. I peeled them, removed seeds, and cut them up in small chunks. Added some oyster sauce, and a few spoons of mayonnaise and a little white wine. Using a hand blender to turn everything into a sauce. Cooked the sauce on low heat. Poured on some leftover chicken. It was very good. Yes, I will make that again. Next time may be some garlic. 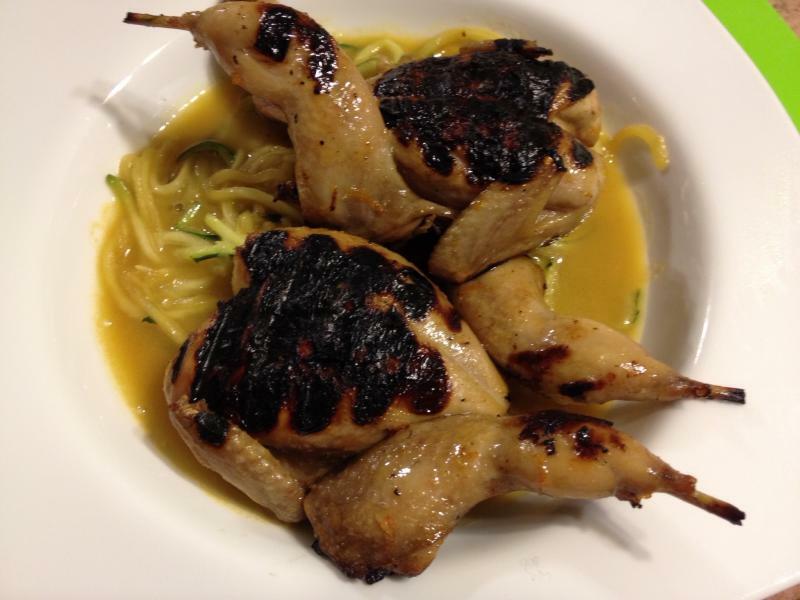 Citrus-marinated quail over zucchini noodles. First time cooking quail and I am not sure that (indoor) grilling is the best cooking method when the marinade contains honey! Or perhaps I should have been more attentive. The marinade included the zest and juice of a navel orange and the juice of one lime. Reduced and enriched with a little butter it was a tasty sauce for the noodles. I love the concept and flavors in your dish. I bought some quail just last week so you've given me some inspiration. Out of curiosity. How do you remove wax from citrus. Do you care if it's organic or not? I am really jealous of Heidi. The idea of lemons coated in wax make me just sigh at the memory of Menton lemons. I've made a couple weeks ago, with the Ipad is more difficult for me to write and link posts, some Portuguese pork ribs with oranges. Really nice. One very nice Italian cake that I bake sometimes is Caprese bianca: almond flour, white chocolate, limoncello and lemon zest. Sometimes I make a middle eastern cake with whole lemons, almond flour, butter and eggs. Honestly I don't spend much time washing citrus. I love the combination of a good piece of fatty pork paired with oranges. And I really like your Italian cake. Would you serve that with ice cream, sorbet or maybe ricotta? And I really like your Italian cake. Would you serve that with ice cream, sorbet or maybe ricotta? It is a very nice cake, quite moist and a little dense (doesn't have gluten in it), definitely more sorbet or ice cream. Citrus fruits are very important in our eating life. They are used in a number of dishes. There's a muffin which takes the entire orange. And a wonderful layered chocolate cake which has an orange filling...it's DH's usual birthday cake. Then there's the Orange- Szechuan pepper ice cream based on David Lebovitz's Perfect Scoop. And a recipe from Power Hungry: The Ultimate Energy Bar Cookbook which takes orange and lemon juice and zest. Not to forget my very popular Margarita Pie, put together from two different recipes, with orange and lime zests, lime juice, etc. A friend sent me a new, now my go-to, recipe for Scones which takes orange zest. Oh, and Ed's favorite Chinese recipe Orange Beef. There is no end to the recipes which I make using citrus fruits. OTOH, we are far from home with only The Joy of Cooking cookbook with us and so we are not making a lot of citrus based dishes, although we have made the Margarita pie twice and the Orange Beef for the annual Chinese Feast (very non-traditional I fear). Oh, and I love slushy Margaritas once a year when we hold the Annual Dog Weekend. Need fresh limes for that. I've never had Key Lime pie. I guess I could do that one here in Utah. We have two luncheons lined up for this week and that could be the excuse needed...if they have Key Limes in the grocery store (not noted for exotic produce). ps. Since posting this I have found a number of Key Lime pie recipe which differ quite a bit from each other. Can someone lead me to their favorite recipe? ?